There’s something to be said for colorful food…especially when it is a combination of fresh, natural ingredients. We’re not talking about artificial food coloring here. Stick with us and you’ll find amazing greens, heirloom grape tomatoes in a rainbow of colors, and farm fresh eggs bursting with flavor. If you happen to be a backyard gardener and your garden is producing bounties–I’m envious. Here in the Midwest, we have a fairly short growing season for things like tomatoes…unless you’re using the help of a hoop-house. If I lived in the country instead of a subdivision in town, I would probably live in a greenhouse during the winter, embracing the heat, humidity and greenery. Fresh ingredients can’t be beat, but preserving tomatoes is one way to keep the flavors of summer ripe throughout the colder seasons. It’s the same reason I like to make applesauce and apple butter after the apples on my apple trees have matured. I hate to have them go to waste and we can’t eat them fast enough. Besides, having that taste year-round is worth it. 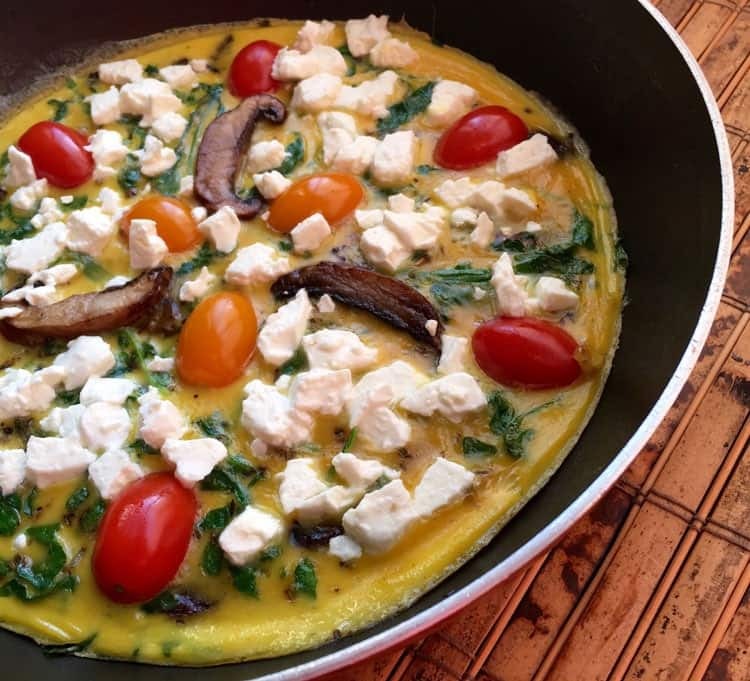 Feta frittatas (and any frittatas, really) are often prepared in well-seasoned cast iron skillets or other non-stick ovenproof pans or cookware. However, a standard 10” non-stick skillet will also work provided you don’t try to pop it in the oven! 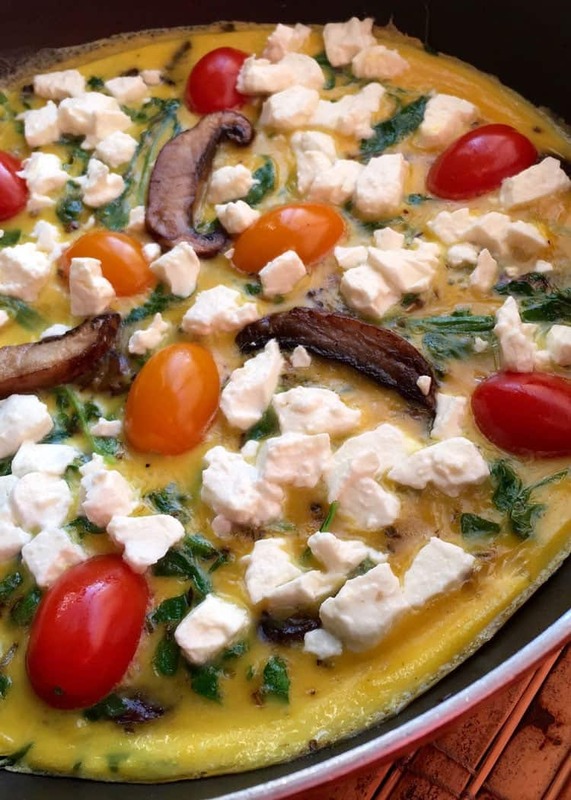 This savory stovetop feta frittata is easy to make and really versatile. You can mix it up and add whatever ingredients happen to be flourishing in your garden. 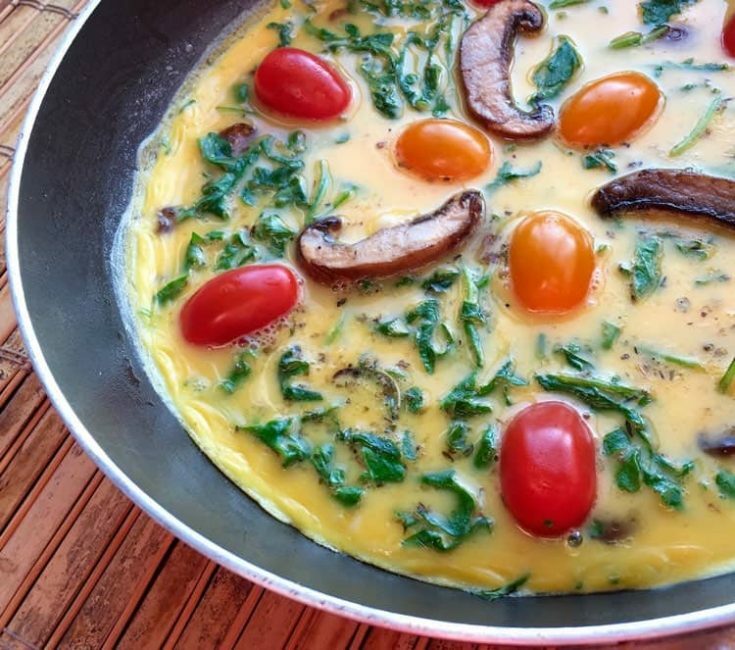 Add in some cheese and you’ve got the most delicious frittata around. The most difficult part is deciding whether you should enjoy it for breakfast, brunch, lunch, or dinner. Whichever you decide, dish up a plateful of your yummy feta frittata and take it outside to sit, eat, and listen to the birds chirping and reflect on your day. In a medium bowl, whisk together 6 eggs, half & half, water, sea salt, and freshly ground black pepper until blended. Set aside. Add olive oil to a 10” non-stick skillet and heat over medium heat. Add Portobello mushroom slices and chopped stems and cook approximately 5-6 minutes, stirring occasionally. When the mushrooms are browned, remove 3 uniformly sized mushroom slices from the pan and set aside. Add arugula to pan and stir constantly until wilted, approximately 1-2 minutes. 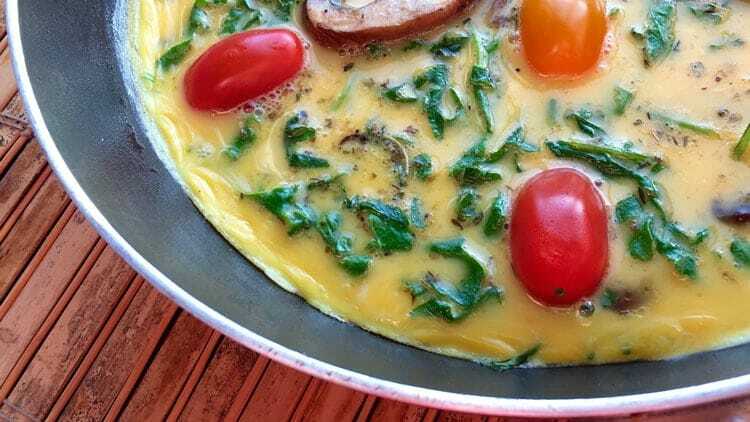 With a spoon, spread ingredients into a uniform layer across the bottom of the pan, ensuring an even distribution of mushrooms and arugula throughout. Pour egg mixture on top and let cook for 1-2 minutes, or until the egg begins to set on bottom. Reduce heat to just above the “low” setting and cover. Cook 8-9 minutes, then remove cover and arrange the 3 Portobello strips, cherry tomato halves, and Feta chunks in a decorative pattern, if desired. If not, simply scatter those ingredients across the top of the frittata before covering again. Cook for another 5-6 minutes, or until the egg is cooked through and the Feta has just begun to melt. Remove from heat and carefully transfer to a serving platter and cut into wedges. Serve warm or enjoy at room temperature.